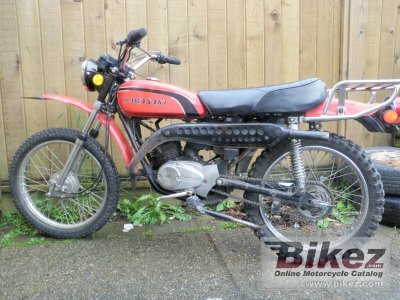 1973 Kawasaki 100 G5. Jason Toews. Submit more pictures. A star for the future. A brilliant MOTO ENDURO that stars on the road or off. The G5 has a smooth-running rotary valve single cylinder engine - newly designed for maximum compactness. Power to take on 33 degree grades. To run up to 70mph on the open road. Optional tuning gives it professional motocross performance. And there�s a five speed heavy-duty wide-ratio transmission for all terrain running. Ask questions Join the 73 Kawasaki 100 G5 discussion group or the general Kawasaki discussion group. Bikez has discussion forums for every bike. View comments, questions and answers at the 1973 Kawasaki 100 G5 discussion group. You can sign up for e-mail notifications when other riders answer you. If you have extensive experience with the MC, please send us a review. If you consider buying this bike, you should view the list of related motorbikes Look at photos. Compare technical specs. And check out the rating of the bike's engine performance, reliability, repair costs, etc. You can compare the rating with other bikes.